We are a renowned organization, which is engaged in manufacturing, supplying and buying a comprehensive range of attractive Acrylic Name Boards. 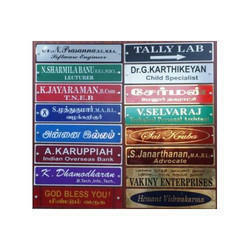 These acrylic name boards are commonly used in the hotels, restaurants, offices and allied places. The offered range of name boards includes Brass Letters, Acrylic Vinyl Name Boards, and LED Illuminated Name Boards. These acrylic name boards are available with us at competitive prices. We are one of the distinguished organizations that are engaged in manufacturing, supplying and buying a wide array of high quality LED Name Boards. 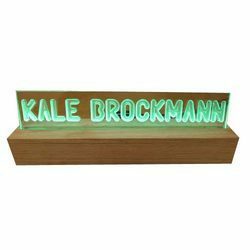 These LED illuminated name boards are manufactured using a high-quality raw material, which is procured from the reliable vendors of the market. Further, to meet the exact requirements of the patrons, we offer these LED illuminated name boards in various sizes, designs, and colors. We are a prominent organization, which is engaged in manufacturing, supplying and buying a wide array of high grade Acrylic Name Boards. These acrylic name boards are manufactured by the experts employing latest machinery and techniques. Owing to their beautiful designs and clear visibility, offered acrylic name boards are widely used in the corporate offices, shops and malls. 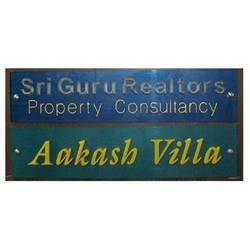 Leveraging on our state of the art infrastructure facility, we are offering superior-grade Engraved Name Boards. The offered range of engraved name boards using high quality natural and laminated wood. The offered range of engraved name boards is available with us in various colors, designs, and other specifications. We are engaged in catering to the respected clients a qualitative range of Letter Name Boards. 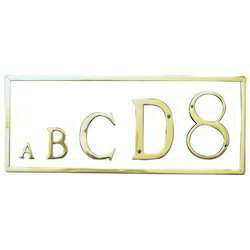 These brass letters are commonly used in homes address plate and business name plates. Our experienced professionals make use of high grade brass to manufacture these letters. Further, we are offering these brass letters in plethora of designs, colors and fonts. Owing to the rich knowledge of this domain, we are manufacturing, supplying and exporting superior quality Brass Name Boards. We are offering these brass etch name boards are available with us in various colors, finishes, designs and other specifications. 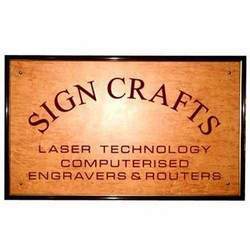 The offered range of brass etches name boards are widely used in the malls, offices and other specifications.